Cette maison mise à jour est située dans le Pacific Grove Beach Tract. En face de l'allée du 18e trou du Pacific Grove Golf Links, il est une puce tir sept de fer de la cour avant le 18e vert. Profitez des belles vues de fenêtres abondantes dans la salle de séjour, cuisine et salle à manger. Nous sommes à quelques pas du sentier côtier et à proximité des restaurants et des boutiques. Les golfeurs peuvent regarder les loutres de mer jouer dans la baie en attendant de prendre le départ à 'Poor Man's Pebble'. Que vous assistiez à l'un des nombreux événements sur la péninsule de Monterey, échappant pour une des filles (ou garçons) le week-end, pour célébrer une étape ou un anniversaire, collecte avec des amis ou en famille, ou en quête de solitude mélancolique - notre maison est l'alternative parfaite à tout hôtel . Voir pour vous-même - nous pensons que vous allez adorer! What more could you want? This home is beautiful, cozy, and thoughtfully equipped with everything you need for the perfect vacation. On top of that, the view is gorgeous from large windows across the front of the house. 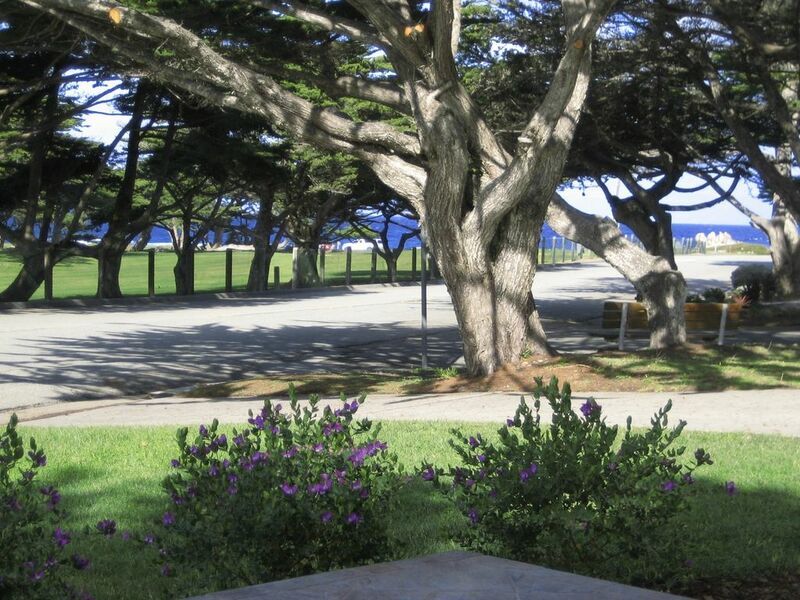 We stayed in every night for dinner, because it was the best view in town: the golf course, cypress trees, lighthouse, deer, and ocean in the distance. For 20 years we have enjoyed vacations on the Monterrey Peninsula, and this is the best vacation rental yet. We hope to return many times. Loved this home.Very clean and comfortable. Location amazing! We definitely will rent this again! Couldn’t have been happier! Loved every minute of staying here. The views of both the golf course and ocean were incredible. We all thoroughly enjoyed watching the deer and they even welcomed us on the front lawn when we arrived. Amazing location and close to everything. We brought our bikes and rode to the wharf. Gorgeous views of the ocean as we traveled on the paved bicycle/pedestrian path. This was a treat! The home was incredibly comfortable and well appointed with everything we needed. We hope to come back soon. Perfect location and house in Pacific Grove! We spent three wonderful days with great weather. We've stayed in Pacific Grove many times, and this house is in the best location. It's also very up to date with all the kitchen and entertainment conveniences, very comfortable and large common spaces and bedrooms, great bathrooms, and beautiful views of the golf course across the street, and the ocean less than 2 blocks away. While we brought our own bikes, the owners provide a couple in the very clean garage, which also has a large washer and dryer. We couldn't imagine a better Pacific Grove rental, and hope to come back soon. This is the second year we have spent a week with family at this ideally located home. The view can be enjoyed in fair or foul weather; deer and geese on the fairway and the crashing waves are visible from the large windows in the living room. We combine family meals prepared in the well-equipped kitchen and going out to eat in restaurants in Pacific Grove and Monterey. Downtown Pacific Grove is within walking distance and a short drive takes you to attractions like the Monterey Bay Aquarium, Carmel, Big Sur, etc. We enjoy walking around the neighborhood and along the beach. The refrigerator was not working and the owner made exceptional strides to deliver us a replacement within a few hours; we have rented several homes in the area and have never received ‘customer service’ like this. The view, location, and level of service makes this a delightful purchase of time at the coast. This property was everything we thought/hoped it would be. I had a very comfortable living area to sit and talk and look at the ocean pounding the rocks just a few blocks away or you could look at the golf course with golfers hacking their ball up the fairway just across the road. (Just to be completely up front so people are not disappointed, this isn't "ocean front property" but you can see a great deal of surf from out the big bay windows.) It had everything we needed and was very well cared for and clean. We would definitely go back. Kelly E.